A father shares the touching story of a preemie born after reverse tubaligation, and 87 days in the NICU. By David L. Meredith, Jr. I think David's story really should start in the winter. It was then that his mother, Abbi had her first surgery to reverse her tubaligation. The doctor who performed her first surgery had no business doing this type of medical procedure. Needless to say the operation was not a success. It would be another two years before Abbi would be ready to try this surgery again. This time she did her homework and researched this doctor's background. Abbi decided to have Doctor Gary Berger in Chapel Hills, North Carolina perform the surgery. Everything about the surgery the second time was much better. Abbi was able to get up and walk that afternoon after the surgery. We had planned this trip to be like the honeymoon that we really couldn't afford after we got married. For the next seven months we faced disappointment after disappointment of learning that Abbi still was not pregnant. Finally, in November, Abbi got a positive reading on a home pregnancy test. Besides the day that my adopting Allison became official, this was one of the happiest days that I can ever remember. Abbi's first sonogram was on November 19. There wasn't much more to see than a little blob, called a "yolk sac". The second sonogram came unexpectedly on January 4, when we were not able to find the baby's heartbeat, at a scheduled doctor's visit. Dr. Murphy was very calm thru it all, keeping Abbi as relaxed as possible. The uneasy thought and feelings were racing thru Abbi's and my minds that Abbi was going to have a miscarriage, but thank God we were wrong! Baby's heartbeat was found low in Abb's belly and beating strong at 167 beats per minute. The reality was starting to sink in for me that we were really going to have a baby! February 15, an unexpected trip to St. Johns hospital. Abbi had a real bad pain in her side, she was convinced it was not baby related but the E. R. doctor ordered a sonogram just to make sure everything was OK with our baby. There was a plus to this trip to the emergency room, as the sonogram revealed that we were having a boy. February 18, Abbi had a scheduled doctor's appointment at KU Med. Center. She was scheduled for an amniocentesis, a procedure where a small amount of amniotic fluid is drawn out and helps determine how great of a risk there is that our child would have certain types of birth defects. After discussing the risks with the doctor, we all decided this was a procedure that we could live without. The risk to our baby was too great, to justify the need for this test. So we settled for a sonogram instead. This sonogram confirmed for sure that we were definitely having a boy. The next sonogram would be on March 25, at around five A.M.
March 25, at around 1:00 A.M., Abbi woke me up to tell me something was wrong and that she was afraid that her water had broke. This is the scariest thing that Abbi could have told me. She was only 24 weeks along! At this point, I knew I had to remain calm to keep Abbi calm. I drove her to the emergency room at St. Johns hospital, and they immediately took her to labor and delivery. An ambulance was called in and Abbi was to be transported to KU Med. Center. Of all the things that could go wrong, our weather was turning cold again. The highways and major roads became icy and slick. I rode in the front seat of the ambulance and watched accidents taking place all around us. After arriving at KU Med. Center, things happened so fast! Abbi was taken to the fifth floor to labor and delivery (arriving at shift change). A resident doctor came in to discuss all options and the best case scenario was to get Abbi on complete bed rest for two weeks, so that our baby's lungs could mature more with the help of modern medicine. The resident doctor decided to give Abbi an examination using a speculum. That is when everything became critical, the doctor discovered that Abbi had a prolapsed cord. The umbilical cord was delivering. Before I could say or do anything, the room was filled with medical personnel, I tried to bend down and kiss Abbi and I was immediately pushed out of the way. All I heard was, "we don't have time for this!" It would be two more days before I was made aware of how life threatening this whole situation was to Abbi. I was left standing there alone in an empty room, not even knowing how to react. I stepped out of the room and looked around, my wife had just been rushed into an operating room for an emergency c-section. I could feel the tears welling up in my eyes. I stepped out into the hallway by the elevators and tried to make a phone call to my family, my father answered the phone, I remember trying to speak but couldn't make the words come out, all I could do was sob. I don't even remember hanging up with my father. I regained some composer and walked back into the labor and delivery area. Somehow, I managed to make it down to the information desk to ask where the hospital chapel was. As I slowly made my way to the chapel, I fought back tears of pain and fear. I knelt at the altar and wept hard, begging God to please let my wife and son be all right. Offering my own life and soul for safe deliverance of my wife and son. I could not imagine living without Abbi and how devastating it was going to be if we lost our son that morning. My first born child! The next three or four hours were a blur, even if I had sat down that morning and tried to recall what had happened during that time, I don't think I could have done it. Abbi was in her room resting as the anesthesia wore off, and by this time my parents had arrived. It would still be a couple of hours before we would have any news about our son. He was in critical condition and they were trying to stabilize him. When I was finally able to see our child for the first time, my eyes again filled with tears, the fear was still there, but now, was mixed with joy. My son lay before me, so tiny, so helpless and only alive by the grace of God and the miracle of modern medical technology. My son was born at 7:38 A.M. on March 25, 2002. He weighed one pound, three and a half ounces, and eleven and a half inches long. The first two weeks of David's life went by trouble free. Everybody was amazed how well David was doing. 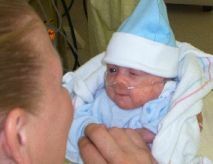 It was unusual for a micro preemie to go that long with no complications. Doctors kept telling us, David's first couple of months were going to be an emotional roller coaster for us. I was over optimistic about David's condition, he was doing great! Abbi quietly waited for the other shoe to drop, and it did. Two weeks, two days after David's life began, he became very lethargic, almost completely motionless. One of his primary care nurses, Nurse Carrie, even made the comment, "This is not the same baby that I have been taking care of." Something was wrong, and one of the things that the doctors told us, "if we ever call you, to come to the hospital, understand it is serious, and you need to get there immediately." We never thought we would get that phone call, but we did. Nurse Gayle called us and said she thought we should get to the hospital as soon as possible. Fortunately, Abbi was with me and we were at my office, only fifteen minutes from the hospital. Our drive to the hospital seemed to last forever as close as we were. Abbi and I were both silent most of the way there. The few words spoken, were of our worst fears. What if he was already dead, and they just wanted us to be there to tell us in person? We both fought back the tears. When we finally arrived, our little boy was still alive, but very sick. David had a staph infection. After the doctor explained to us the severity of what was going on, Abbi and I went to his bedside and cried. Embracing each other, looking at David, and both of us whispering silent prayers to God. The next two weeks and three days was a living hell for us, not knowing if David was going to recover from this infection or not. Watching his little foot get pricked every hour to draw blood from his tiny body, to determine the level of infection. Then every couple of days giving him a transfusion to replenish what was being taken from him so often. Things finally started to stabilize on the eighteenth day, as he started to show signs of improvement. His body weight dropped to one pound, and thank God, he only dropped one gram below a pound before his weight started to increase. Little by little, his weight started going up gram by gram. He occasionally lost a little, but by the next weigh, he had regained that plus a little more. I remember it being a real struggle to get him to two pounds, but he finally made that first real big mile stone. Then the day had finally arrived when the doctors decided David was ready to graduate to a ventilator from an oscillator. His second major milestone! With this progress, came something else we were not expecting. The date was April 19, we came in for our regular visit and was given another major surprise, David was ready to be held. His mother made the ultimate sacrifice to her husband that evening. Abbi decided that since this was my first born child, it would only be right if I held him first. Tears rolled down my cheeks as Nurse Sandy laid David on my chest. We still were not able to hear him cry or make a sound, because David still had a breathing tube going down his throat for the ventilator. On April 21, Mommy got to hold David for the first time, Another milestone in our lives. On April 26, 2002, David was moved into an isolette, and on April 30, the medical staff decided David was ready to try the c-pap. Our little boy was really working his arms around and figured out how to pull his breathing tube out. David struggled off and on for about a week on the c-pap before he officially made the transition. Now that he was on the c-pap there was nothing there to stop him from making vocal sounds. Another milestone for us. I remember telling everybody, "it was music to my ears to hear him cry for the first time." Abbi even shed a few tears the first time she heard our son cry. About three or four weeks later, David graduated to the canula. Some time in May, David started having "brady" spells. That is where his heart rate would drop dangerously low, and most of the time he would recover with minimal stimulation. David managed to give us a few good scares with his "spells". After 87 days David was able to come home. It got to be very emotional saying good bye to a lot of the NICU staff. Nurse Carrie walked us out of the hospital and sent us on our way. He is home now on oxygen and an apnea monitor, and doing great! Our little boy now weighs four pounds, six ounces and is sixteen and a half inches long.